Seeking some inspiration but don't know where to look? Follow these top design agencies on Twitter. Whether you work in graphic design, web design or 3D, the web is full of inspiring content – and Twitter is a great place to find it. But the social media platform can be an overwhelming experience if you don't know where to look. So to help you out, we've rounded up this list of top design agencies to follow on Twitter. They'll point you in the direction of awesome creative content and industry insight in no time. Studio Sutherl& only launched in 2014, but has quickly established itself with a stunning portfolio, and recently bagged the number one spot on Computer Arts' list of the UK's top 50 studios. 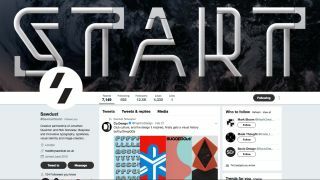 The studio's Twitter features some great examples of its work, and is well worth turning to for graphic design and typography inspiration. We're totally down with The Beautiful Meme's outlook: 'Simultaneously taking everything too seriously and not very seriously at all.' Look carefully and you'll find some great examples of the brand and advertising agency's work, but it's the random images and videos, and occasional 'Mood in the studio' tweets, that'll get you hitting the Follow button. Formed in 2015, Koto designs and builds brands across digital and physical, and made its name with a global rebrand for Fanta. Its feed is the perfect place to look if you want to see some cutting-edge branding work from a studio that believes in uncompromising positivity, cadence and endless hustle. A veteran brand consultancy with over 20 years' experience under its belt, johnson banks specialises in cultural, educational and not-for-profit clients, which makes for an inspirational Twitter feed. Recently the team has been celebrating founder Michael Johnson's D&AD President's Award, while giving his book, Branding: In Five and a Half Steps, a well-deserved boost. Sawdust, the creative partnership of Jonathan Quainton and Rob Gonzalez, has won D&AD and Type Directors Club awards, as well as coming a creditable 11th in Computer Arts' 2016 rundown of the top 30 UK design studios. The pair's Twitter feed is a great place to catch up on recent work, cool stuff and the odd Photoshop tip; apparently Batch Automate Sequential Saving has changed their lives. Web design and user experience consultancy Happy Cog specialises in targeted, effective content and standards based design. With multiple tweets a day, this is a brilliant Twitter feed to follow to keep up-to-date with all things in the world of web design. Supereight is a small and friendly UK studio that creates lovely websites, apps, icons and illustrations. The team don't tweet so often, but everything they post on their account is certainly worth reading. Californian product design company ZURB is a close-knit team of product designers who help startups and larger companies design websites, services and online products. As you can see from their Twitter feed, they're very responsive to their 32k+ followers and keen to engage in conversation with them. Based in Vancouver, SmashLab is a creative agency with expertise in digital, brand and advertising. Its Twitter feed is a hearty mix of all the things agencies do best on the social network: sharing design process insights and useful articles, and truly engaging with the community. Digital Jungle is China's largest independent content-focused digital marketing agency, boasting 120-plus staff in China and Asia. Its main focus is working with Western organisations to deepen the relationships between their brands and Chinese consumers – so the firm's Twitter feed often offers fascinating insights into how the East and West is working together.